Hello my fabulous Fawn fans! Today, I have a special guest post/article by Jenny Franklin. She is here to give us wonderful tips on how to create a "father-to-be" friendly baby shower that will allow for a fun and festive celebration that will make he and his friends feel right at home! Now I know what you’re thinking---but take a second to think about it. A co-ed baby shower is the fun and new thing to do! Get your man involved, and tell your girls to do the same. By the end of this article, you’ll be able to convince them to go to attend the baby shower with you, and will not believe why he’s never thought of it before. Now, baby shower themes and parties used to be only for girls. Which, it most certainly can be. The door is just beginning to open for the males—and I wanted to know immediately (after I attended one) why this has never happened before! It was so genius, and so incredibly fun. Even the dudes were enjoying it. So how do we get them to come? Easy. First, the food. Because, what man doesn’t enjoy food? Just remember when preparing the snacks, that you aren’t overdoing it in one basic color. If a man walks in a room full of the color pink, he’s going to want to immediately leave. I’m not saying not to have the color, just tone it down a bit. Clever and simple. 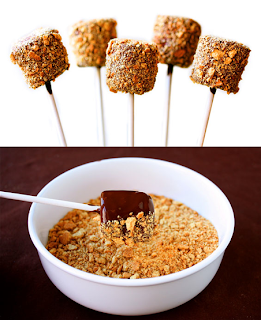 Dip a marsh mellow in chocolate; roll it around in graham cracker crumbs, and voila! 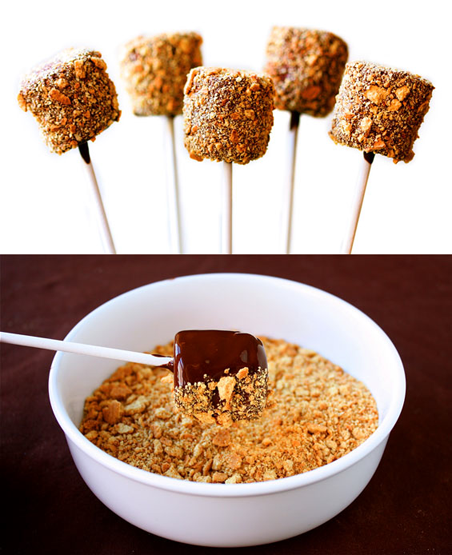 A yummy smore that everyone will love. 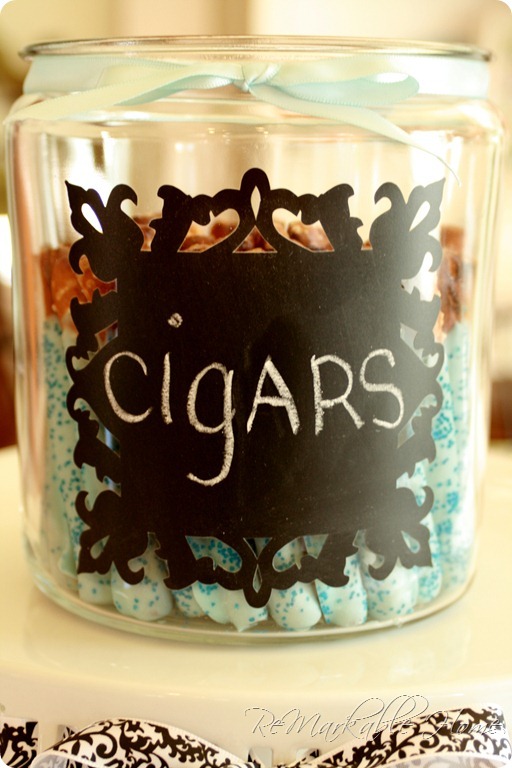 Now they aren’t real cigars, just a cute little way of placing them (and something that the boys will love!) Just dip pretzel sticks in whatever coating you’d like (I’d pick chocolate) and sprinkle it with the color of your theme. Those are just a couple of cute and simple ways for creating snack for your baby shower—that your man won’t complain about! Next, are some fun games that they will really get into playing. Now this is super easy and super fun. Split the group up into two teams. Each person gets a balloon (pick a color for your theme). On “go” the first person on the team blows up their balloon, and stuffs it under his/her shirt. After they accomplish that, the next person does it, and so on. After everyone has a full balloon under their shirt, they must each pop it one at a time. The first team to blow up and pop their balloon wins! Now, this game is hilarious. All you have to do is borrow to dolls (or stuffed animals, whichever you have easier access to). Have the men split up one vs. one. Blindfold them, and time them to see who can “best” diaper the doll or stuffed animal. This one will be really fun to watch! Finally, some party favors for both the men and the women. 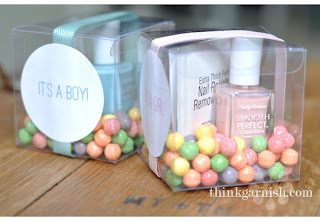 For the girls, give each of them a plastic case filled with your favorite candy and nail polish. All of these can be found at a dollar store, and it’s super cute! Not to mention really easy to make—and everyone will love them! For the boys, it’s kind of the same idea, except completely filled with food (because come on, we know that’s a give-in). 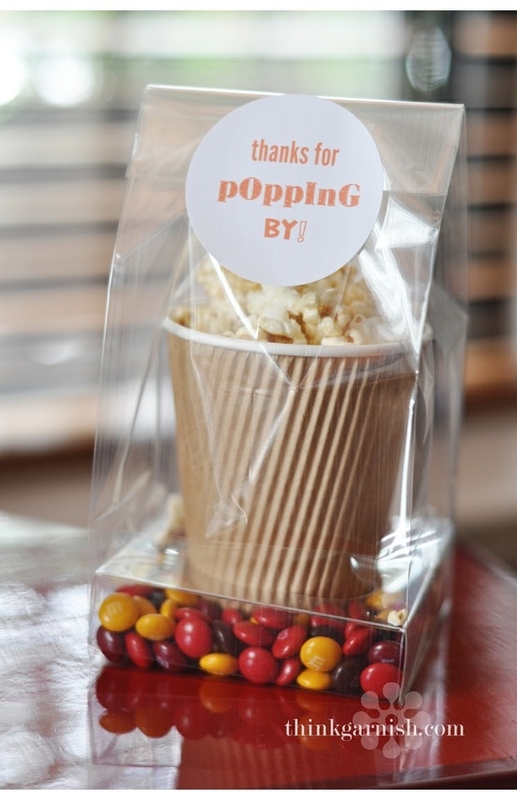 Place popcorn in the clear container, and write a cute phrase. 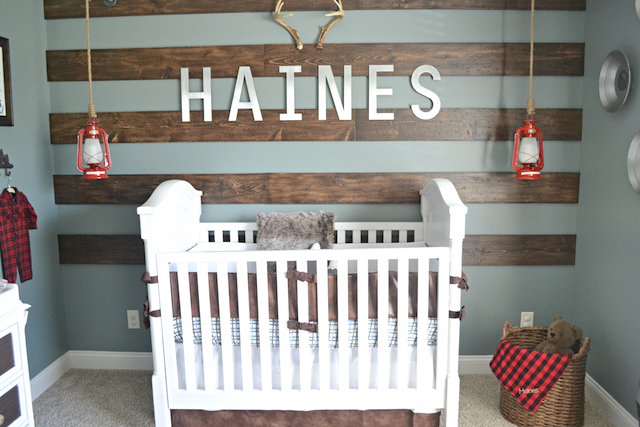 After creating this fun and awesome co-ed baby shower, you’ll wonder why this was never really done before. 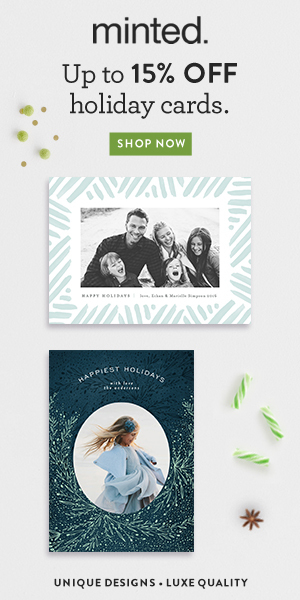 It gets everyone together for this special day—and it’s fun and simple. Everyone will congratulate you for how thoughtful and creative you were with all of the planning, even the boys. I’m sure of it! Jenny Franklin is a bit of a party savant. When she’s not busy planning and preparing, you can find her here .